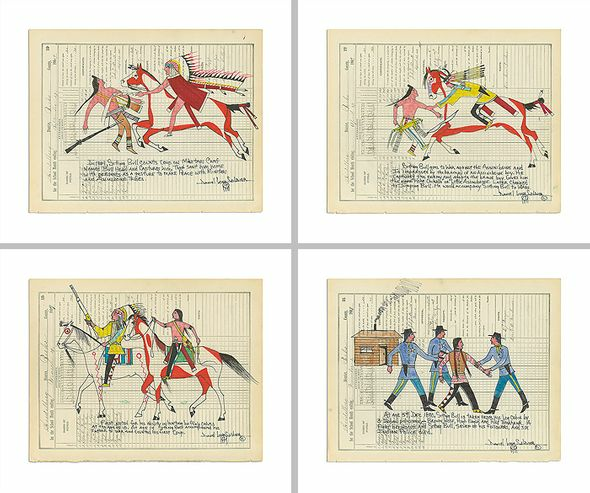 Daniel Long Soldier Limited Edition Fine Art Giclée Diptych Print Suite: "The Story of Sitting Bull (Set of 4)"
Edition: Artist Signed and Numbered, Limited Edition to 45 with COA. About the Art: Sitting Bull (c.1831-1890) was the Native American chief under whom the Sioux tribes united in their struggle for survival on the North American Great Plains. 1. First noted for his ability in hunting buffalo calves at the age of 10. At age 14 Sitting Bull accompanied his father to war and counted his first coup. 2. Sitting Bull goes to war against the Assiniboine and is impressed by the bravery of an Assiniboine boy. Gives him the name "Hohe Chikala" or "Little Assinboine." Later changed to Jumping Bull. He would accopmpany Sitting Bull to wars. 4. At age 59, Dec 1890, Sitting Bull is taken from his log cabin by 3 Indian policemen -- Brown Wolf, High Eagle and Red Tomahawk. A fight breaks out and Sitting Bull, seven of his followers, and six Indian police died.